The Common Meal is a special workshop where participants prepare a delicious seasonal meal at a workstations during the afternoon, starting at 4pm. 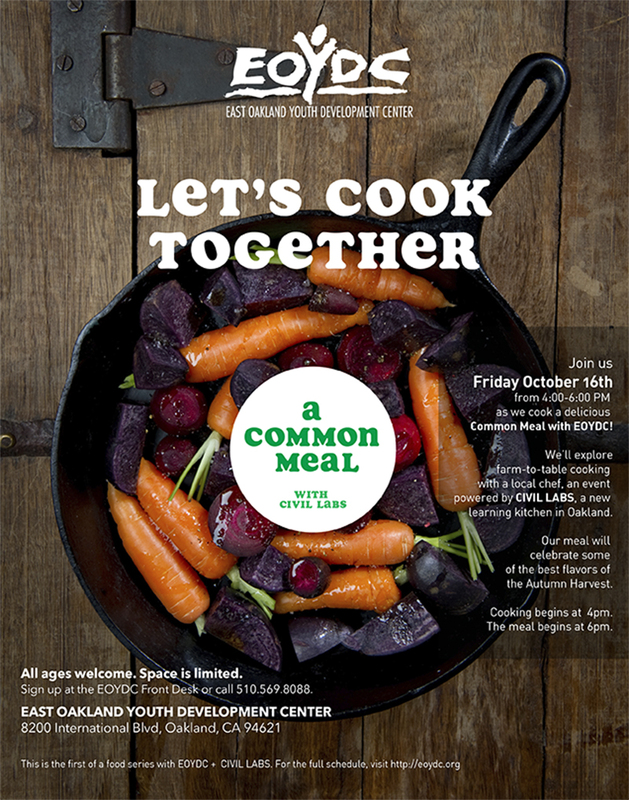 At 6pm the meal is served to the EOYDC community. Families and friends can enjoy a fresh and healthy meal while sitting together at long, farmers tables. All ages and skills sets are welcome. The Farmer’s Market is a small market with produce. After checking in at the small stand in the front of the Center, visitors can choose fresh fruit, vegetables, eggs, dairy, grains, nuts, bread, and olive oil to add to their tote bag. A few simple recipes using the available ingredients will be available to taste and take home. Power Snack will demonstrate, with the help of youth, a delicious soup and fresh veggie snack, first prepared and then served with a bell as a short, communal snack break to anyone at EOYDC. Take home an extra portion in mason jars and a Civil Labs tote bag. This version of Power Snack happens during EOYDC’s Family Night event. Youth, Family and Friends create a delicious soup and fresh veggie snack, first prepared and then served to anyone at EOYDC. Take home an extra portion in mason jars and a Civil Labs tote bag.